We are comparing Gourmet Tapas Style Seine River Dinner Cruise Prices from leading ticket suppliers and Try to find you Cheap tickets prices on the market. Relax on a fun cruise f the River Seine on a comfortable river boat with indoor seating with panoramic views from the floor to ceiling glass windows and an open-top deck. The tapas tasting menu will include delights such as vegetable rolls, seasonal veg, warm toast, sushi, candied duck, slices of chicken heart, fish and chips, chocolate tart, fruit dessert, and seasonal fruits. All drinks can be purchased from the onboard bar whether you're drinking soft drinks, wine, champagne, or cocktails. Great for couples, friends, and groups looking to let their hair down on a relaxing river cruise. An enjoyable way to party on the river! A great way to celebrate a birthday or other special event. Your Experience With Gourmet Tapas Style Seine River Dinner Cruise? Board the boat at 8.15pm at the Austerlitz dock and get comfortable at your table, relaxing as you let the live music wash over you and relax with a drink from the bar. At approximately 9.15pm your cruise along the River Seine will begin and through the journey you'll be served with up to 10 tasty tapas dishes comprising of starters, mains, and desserts all prepared onboard by the chef as you watch Paris pass by the windows in all its glory, lit up at night. A photographer will be onboard and you can purchase prints or a memory stick with photos to remember your evening on the river. The boat will return to the quay at approximately 11.30pm and you're invited to stay onboard for another 1.5 hours to enjoy a dance party on the water. What Gourmet Tapas Style Seine River Dinner Cruise Includes? There is a smart/casual dress code so be sure to dress up a little! Travelers Reviews about Gourmet Tapas Style Seine River Dinner Cruise? This is a new cruise so there are not so many reviews yet, but travellers talking about this cruise on Get Your Guide give it high ratings and mostly very good reviews, describing it as fantastic, excellent, and super. The service gets mixed views, some people saying the waiting staff were very friendly and helpful but others saying it was slow and disorganized. Everyone agrees that the food is very good with delicious and beautifully presented French cuisine served tapas style but some travellers were taken aback at the price of the cocktails - 10.00 per drink. 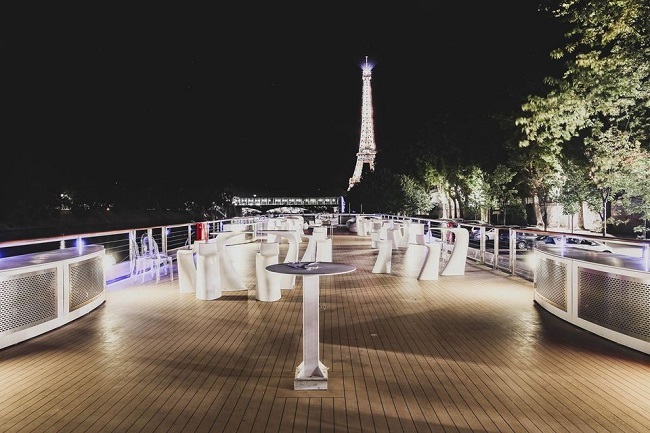 But, you only live once, where better than to enjoy a cocktail than whilst cruising on the river seine?! One happy cruiser said " We had a nice evening thanks to a beautiful cruise on a beautiful boat whose terrace was accessible, a good meal, a good service and a good dancing atmosphere at the end of the dock"
Travellers also agree that the party atmosphere is very good with a great DJ onboard. Wheelchair Accessible - Notify the company at time of booking. Notify the booking company if you require a vegan, vegetarian or have any food allergies.